– New Flows with precision wind rules. 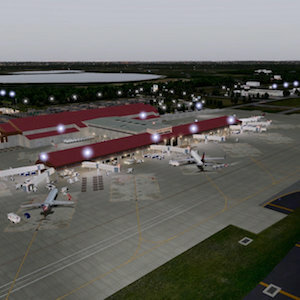 NAPS presents to you ….. KTLH Tallahassee Regional Airport (Florida, USA) and Doak Campbell Stadium. I cooperation of CAMI and Freddy De Pues (NAPS | Advanced Sim Scenery North Atlantic and Pacific Scenery). The updated version comes with 1 minor update namely correcting a sign in the middle of a RWY. – Color corrected USGS orthophotos blended in X-Plane environment etc.